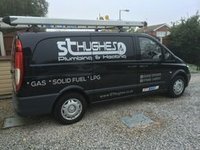 S T Hughes Plumbing and Heating is an established plumbing and heating contractor with a proven ability to carry out and complete projects of a wide and varied nature. We operate in both commercial and domestic fields from boiler houses to the humble 2 up 2 down,new build or refurbishment. We are committed to providing an enthusiastic dedicated and flexible service. As a company we believe in an effective Health and Safety policy and seek to reduce the risk to person and property. We are proud of our reputation for reliability and are committed to upholding this for all our clients. Sean and his apprentice converted our en-suite into a wet-room for my disabled husband. Both delightful, kind and helpful chaps. Wonderful work done and no mess at all. Very highly recommended, we wouldn't think of using any other plumber now. Always on time and informed us daily of the status of the job. Also fitted a combi-boiler. We were never left without electricity, water or heating. Brilliant - thank you Sean. Shaun did a brilliant job. Very clean and tidy, thank you. Asked Sean to fit a gas hob at short notice. He came next day & did a great job. Have used him before to fit a shower & a radiator. Would use him again & recommend him. The time taken & quality of work was exceptional - very accommodating and professionally done. Would recommend him to anyone.